Learn play the clarinet easily with a great technique. Learn how NOT to blow and use your LIPS - not your LUNGS. Product Details You wouldn't expect to drive on a motorway without learning to control the car, would you? Yet the popular "primers" expect you to be able to play music without learning how to "drive" the clarinet first. We show you how to play the clarinet effortlessly and correctly. No matter whether you are a beginner or an old hand. Then playing music is a pleasure and not an embarrassment. We cover the essential basics like making a good clarinet embouchure - from the first sound to playing top notes. Low notes, clarion notes, altissimo notes, how to play softly, how to play loud - and easily, with great tone quality. 1. My right thumb and lower arm hurt after I have been playing for a while. 2.There is a distinct hiss when I play 3. I cannot get the notes to play softly - they just vanish into a hiss. 4. Often I cannot get a sound when I play bottom G, F, E, or clarion D, C, or B 5. I cannot get notes above top space G - they simply squawk downwards 6. I put the mouthpiece in the correct position, but all I get is squeals 7. I have trouble crossing the break smoothly. 8. The notes above clarion G are flat and difficult to get 9. I can get top notes only if I use very hard reeds. 10. I get squeals when I try to tongue a note. 11. My cheeks puff uncontrollably and I get a sore throat after playing the clarinet 12. How do I play loudly or softly without changing my lip pressure? Find the answers in the Clarinet Technique Doctor We explain clearly and simply how to: Form and develop a good clarinet embouchure; how to play legato and staccato tonguing correctly; how to select a reed and advice on choosing a suitable mouthpiece. 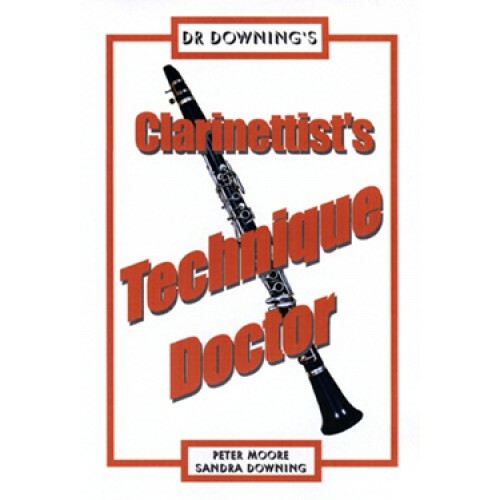 Whether you are a beginner or an old hand, you will find this book essential in giving you a good clarinet technique. We know the problems of overcoming faults - because we both had to do it ourselves before we could play easily and fluently. Follow our advice - do what we do - and we promise that you will ENJOY your playing a lot more. About the Author In 1956, at the age of 18, I started to teach myself to play the clarinet from the books then available. I struggled to achieve a good technique due to the contradictory advice offered in the existing primers and tutor books. They are still around today - 63 years later! If there is a fault to be played on the clarinet, I have suffered them all.